Little Painted Nails: What'cha Talkin' 'Bout Williston? Thanksgiving was an interesting time of year this time around. 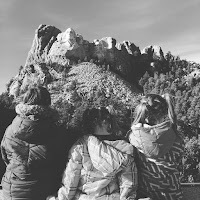 My wife and I decided to take the girls to North Dakota to visit my brother-in-law and his family. In true Grizwold style, we decided to visit a place called the Jewel Caves, the Crazy Horse Memorial and Mount Rushmore on the way. We loaded up the vehicle with snacks, three kids, two in-laws, the wife and yours truly and made our way into the great white north. Twelve hour drive with three different tourist stops, what could go wrong? First of all, the Jewel Cave is remarkable. I'd never heard of it before our stop, but it really is incredible. It has currently has had seventeen of it's miles discovered but it figures to be much larger, per our tour guide. This is the same tour guide who turned out all of the lights to show us how predictably dark it is thirty stories underground. A demonstration that one three year old objected to and expressed her displeasure with a cry/scream hybrid. The problem was the stand-off that ensued, the kid wanted to cry until the lights came up, the guide seemed to be unwilling to turn up the lights until she had finished her song and dance. It was a careful dual in which the child finally won. Crazy Horse and Mount Rushmore were great, too. Perhaps we went through a little quick, but still impressive. Fun Fact #1: Mount Rushmore would fit entirely in the head of Crazy Horse, if you had the means and the inclination to do so. Fun Fact #2: At the rate in which they are constructing the Crazy Horse Memorial, my grand kids will need to see their nineties to see the halfway point. Fun Fact #3: Privately funded Crazy Horse cost around $30.00 to get the family into, National Park Mount Rushmore...$5.00. There is a lesson in there about private companies and government agencies but I'm not sure what it is. Honestly the ride there was fairly uneventful, and Thanksgiving was nice. My brother-in-law smoked a top loin that brought a tear to my eye. It was so good I almost forgot about the fact that there would be not be my wife's 'Chardonnay Turkey' this year. The problem, in truth, was the return trip. No monuments, no tourist traps, just twelve hours with seven passengers, better than half of which picked up a flu in Williston, ND. Fun Fact #4: In Williston, there are several gas stations that also sell firearms and liquor. Nothing in the world says 'freedom' like being to pick up Skittles, an AK-47 and a liter of Jagermeister from the same store. Fun Fact #5 The afore mentioned gas station also had a rack out front for processing your deer or elk. That's actually more of a sticky fact as I didn't notice the carnage until it was too late for my Nikes. The lesson this week, girlies? I was apprehensive before making the trip. I have never been a 'half the fun of any journey is the travel' kind of guy. I'm more of a 'Xanax on the plane makes the flight quicker' person. Maybe that's something for me to work on. It was really a lot of fun. I understand that you may not have seen a lot of the country side as your little faces were stuffed in iPads and the like, but it was really pretty. There were a few bald eagles, deer and enough antelope to keep Williston in target practice for a decade. The monuments were impressive, they and the cave reminded me of how small we really are in this journey we are on. I suppose the real lesson is that this whole go-around is a journey, and it's best not to Xanax your way through it. On a more somber note, over the Thanksgiving weekend, there was a car accident involving the son of a friend of mine. It's been a rough few weeks for the Ryder family and it seems they are far from out of the woods. I've never met Nash but the stock he comes from is about as good as it gets. They are a very loving family and Mai, Nash's mother, is a very special lady. If you have a few dollars and want to give, the karma you'll get back will be tremendous. If you are interested, click HERE and chip in.